This one is so simple you might wonder why I am even posting about it. It’s what some of my fellow bloggers might call a ‘non-recipe’. And yet, the frullato is so essential to the Italian summertime food culture that it would be malpractice not to mention it. And besides, it’s delightful. 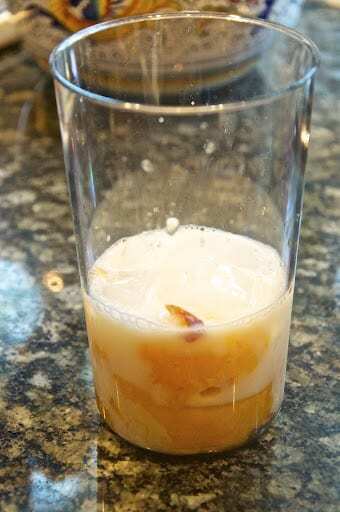 A frullato di frutta, or Italian fruit smoothie, is nothing more than chopped up fruit blended together with milk (or, less commonly, orange juice) and ice, sweetened with a bit of sugar or simple syrup. All you really need is a reasonably powerful standing or hand immersion blender and your frullato will be ready, quite literally, in seconds. It makes a great ‘pick me up’ on a sweltering afternoon. 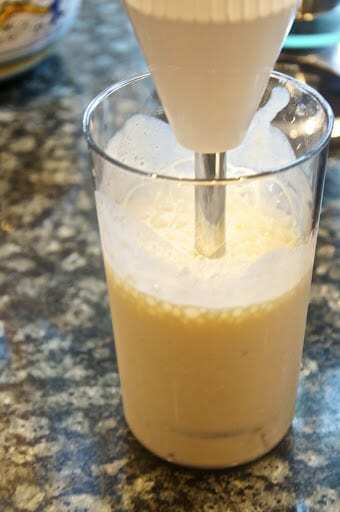 Put the cut up fruit and ice cubes in a blender or, if using a hand immersion blender, into its beaker or a tall glass. Add enough milk just to cover the ingredients and, if you like, a spoonful of two or sugar or syrup, just enough to enhance the fruit flavor. A proper frullato should not be cloyingly sweet. Blend until perfectly smooth and serve your fruit smoothie immediately. Obviously, the character and quality of a fruit moothie will depend almost entirely on the fruit you choose. For best flavor and a smooth texture, it is best to use very ripe fruit. In fact, this is a great way to use fruit that has gone past its prime for eating whole, like speckled or even bruised bananas. The most common fruits for making frullati are probably strawberries and bananas, but just about any fruit can do the trick: blueberries or other types of frutti di bosco are really nice, as are summer fruits peaches or melons. For a more exotic frullato, a nice, ripe mango would be a great choice. I’ve even seen frullati made from oranges and other citrus fruits. While I’m not usually a fan of skim or part-skim milk, I find that they actually works better in frullati. A fruit smoothie made with whole milk, while delicious, can be a bit too rich and ponderous, especially when using an already creamy fruit like bananas. As mentioned, you can use fruit juice instead of milk if you want to avoid dairy or simply feel like a change of pace. (Orange juice is usual but apple juice would also do fine). The addition of a sweetener is pretty standard, although you don’t really need it if your fruit is very ripe and flavorful. But, alas, a lot of our fruit does not fit that description. I prefer to use simple syrup, which is very easy to make and lasts forever in the fridge, as it gives the drink a very smooth finish. If you do use sugar, better to use superfine or ‘caster’ sugar; regular sugar tends to give the frullato a slight ‘gritty’ mouthfeel. Honey is a nice, natural alternative as well. Some folks like to add fresh herbs like sweet basil or mint to their fruit smoothie. I’ve never tried this but it does sound rather nice. Blend until perfectly smooth and serve immediately. Simple is my favorite. This is so refreshing and beautiful, I must make this smoothie ASAP! We make these all the time. They are really great for summer! It’s time! Have a wonderful weekend, Frank! Here, here! Thanks for stopping by, Drick! Goes to show. Nothing like something you've seeded, nursed and grown yourself. At the end of the day it all boils down to the quality of the ingredients. If only we could learn to cherish our ingredients, their origin and quality the way the Italians do. That passion for good food needs to be spread throughout the world, methinks. Haha, I'm laughing at Trix's comment. But also agreeing:) I can't think of a better drink to cool off during the summer than a fruit smoothie. So glad you shared it Frank. And thanks for pointing it out. I hadn't noticed! Mango makes an incredible smoothie! And a dab of yogurt gives it a little zing. So true! Who doesn't love a smoothie? Hmm, am I one of those fellow bloggers to whom you are referring? ; ) Well, this is just the sort of unrecipe that SHOULD be posted!! This is actually the sort of thing I would like for lunch on a humid day. So very simple and healthy. Makes me miss the simplicity of good Italian Seasonal ingredients. Truly delicious! Totally right, Frank: summer means frullato di frutta. I've been making a smoothie a day this spring/summer. And I just happen to have a fresh mango on the kitchen counter right now. So this will be my breakfast this morning. Thank you for today's recipe. I might add a bit of yogurt though. Oh the memories of traveling to Italy. Very common on the coast of Amalfi. I love these fruit smoothies!